Seaborgium (Sg) is element 106 on the periodic table of elements. It's one of the man-made radioactive transition metals. Only small quantities of seaborgium have ever been synthesized, so there's not a lot known about this element based on experimental data, but some properties may be predicted based on periodic table trends. Here's a collection of facts about Sg, as well as a look at its interesting history. Seaborgium was the first element named for a living person. It was named to honor contributions made by nuclear chemist Glenn. T. Seaborg. Seaborg and his team discovered several of the actinide elements. None of the isotopes of seaborgium have been found to occur naturally. Arguably, the element was first produced by a team of scientists led by Albert Ghiorso and E. Kenneth Hulet at Lawrence Berkeley Laboratory in September, 1974. The team synthesized element 106 by bombarding a californium-249 target with oxygen-18 ions to produce seaborgium-263. Earlier that same year (June), researchers at the Joint Institute for Nuclear Research in Dubna, Russia had reported discovering element 106. The Soviet team produced element 106 by bombarding a lead target with chromium ions. The Berkeley/Livermore team proposed the name seaborgium for element 106, but the IUPAC had a rule that no element could be named for a living person and proposed the element be named rutherfordium instead. The American Chemical Society disputed this ruling, citing the precedent in which the element name einsteinium was proposed during Albert Einstein's lifetime. During the disagreement, the IUPAC assigned the placeholder name unnilhexium (Uuh) to element 106. In 1997, a compromise allowed that element 106 be named seaborgium, while element 104 was assigned the name rutherfordium. As you might imagine, element 104 had also been the subject of a naming controversy, as both the Russian and American teams had valid discovery claims. Experiments with seaborgium have shown it exhibits chemical properties similar to tungsten, its lighter homologue on the periodic table (i.e., located directly above it). It's also chemically similar to molybdenum. Several seaborgium compounds and complex ions have been produced and studied, including SgO3, SgO2Cl2, SgO2F2, SgO2(OH)2, Sg(CO)6, [Sg(OH)5(H2O)]+, and [SgO2F3]−. Seaborgium has been the subject of cold fusion and hot fusion research projects. In 2000, a French team isolated a relatively large sample of seaborgium: 10 grams of seaborgium-261. Phase: It's expected the seaborgium would be a solid metal around room temperature. Ionization Energies: Ionization energies are estimated. Isotopes: At least 14 isotopes of seaborgium are known. The longest-lived isotope is Sg-269, which has a half life of about 2.1 minutes. 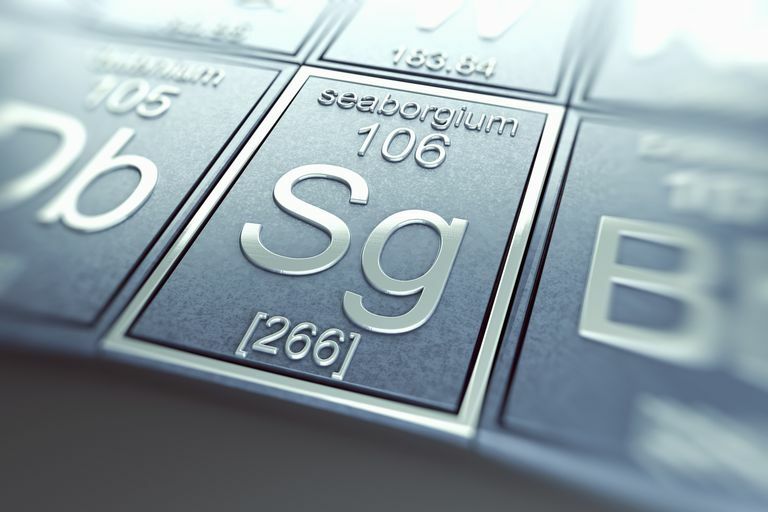 The shortest-lived isotope is Sg-258, which has a half-life of 2.9 ms.
Sources of Seaborgium: Seaborgium may be made by fusing together nuclei of two atoms or as a decay product of heavier elements. It has been observed from the decay of Lv-291, Fl-287, Cn-283, Fl-285, Hs-271, Hs-270, Cn-277, Ds-273, Hs-269, Ds-271, Hs-267, Ds-270, Ds-269, Hs-265, and Hs-264. As still heavier elements are produced, it is likely the number of parent isotopes will increase. Uses of Seaborgium: At this time, the only use of seaborgium is for research, primarily toward the synthesis of heavier elements and to learn about its chemical and physical properties. It is of particular interest to fusion research. Toxicity: Seaborgium has no known biological function. The element presents a health hazard because of its inherent radioactivity. Some compounds of seaborgium may be toxic chemically, depending on the element's oxidation state. A. Ghiorso, J. M. Nitschke, J. R. Alonso, C. T. Alonso, M. Nurmia, G. T. Seaborg, E. K. Hulet and R. W. Lougheed, Physical Review Letters 33, 1490 (1974). Fricke, Burkhard (1975). "Superheavy elements: a prediction of their chemical and physical properties". Recent Impact of Physics on Inorganic Chemistry. 21: 89–144. Hoffman, Darleane C.; Lee, Diana M.; Pershina, Valeria (2006). "Transactinides and the future elements". In Morss; Edelstein, Norman M.; Fuger, Jean. The Chemistry of the Actinide and Transactinide Elements (3rd ed.). Dordrecht, The Netherlands: Springer Science+Business Media.